Stříbrná mince Otrokářská královna, speciální BU proof, 1 oz The first release of the Silver Bullet Silver Shield series was related to the Debt and Death paradigm, with the Rothschild banking family, while this one, the third release (and second negative medallion) relates to a controversial connection of the British Royal Family with the same paradigm. 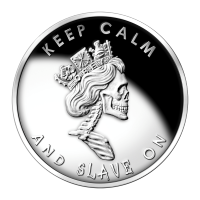 The obverse depicts the smiling Slave Queen with a crown with the word OBEY inscribed on it, and three symbols: "The first symbol is a Poppy blossom symbolizing the many decade long Opium War against China. The British had a long time silver trade deficit with China as a result of the English consumption of China's silk & tea." "The second symbol is the Rothschild crest that made its first appearance on the Debt and Death Medallion, and it symbolizes banking power taking power from the Royal Family long before the Queen was born." "The final symbol is the Eye of Providence, a controversial symbol that some belive represents a trick to get us to self-regulate because of constant fear that we are being watched by a higher authority. This symbol is commonly associated with Freemasonry, and appears on the United states one-dollar bill." The reverse shows Classic Silver Bullet Silver Shield Crest with the sayings "A Conscious Solution To Collectivist Problems" and "Listen To All. Follow None". The Silver Shield is flanked by 47 Silver Bullets representing the atomic number of silver. The obverse of the round has a satin BU finish, while the reverse has a proof finish.